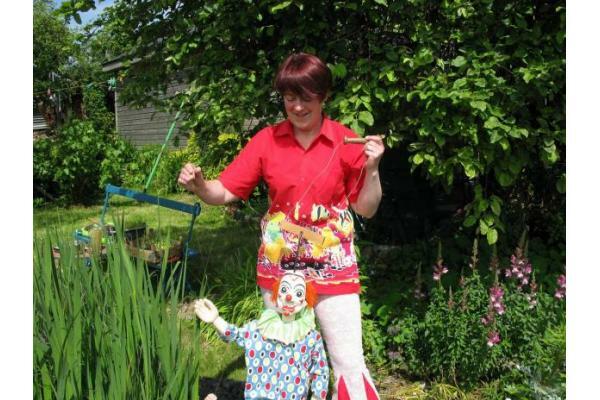 Julie-Rose has been performing puppet shows which she has designed and created for 26 years, nationwide and abroad performing also in international puppet festivals she has worked with the Abbey, Ark and Project and in community and schools theatres. Specialising in Puppet Shows and Entertaining Children and Adults alike for over 30 years! Have fun making your own puppets and masks, then put on a performance. Double bill Sinbad the Sailor followed by Red Riding Hood. Create learn and perform with your own shadow puppet .Meet the collection of shadow puppets from around the world which Julie-Rose has collected over many years .Age guide 7 years to adult . Puppet shows brought up or down to the appropriate level of the audience. Puppet making workshops such as shadow very good for people with poor eyesight.